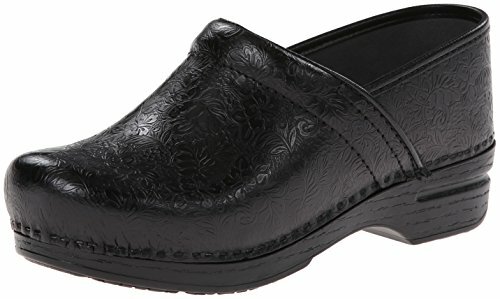 Dansko Women's Pro XP Mule,Black Floral Tooled,39 EU/8.5-9 M US | What Should I Say? The look you love is now available with a slip resistant outsole and softer feel.Slip resistant Lightweight construction Removable footbed Leather Heel height is 2 inches Manufacturer Restricted Item Restrictions dictated by the manufacturer prevent us from allowing any discount to be applied. Slip-on leather mule featuring roomy toe box and anti-fatigue rocker bottom.